Neighbors are on edge after they say two dozen cars were vandalized in their neighborhood overnight. 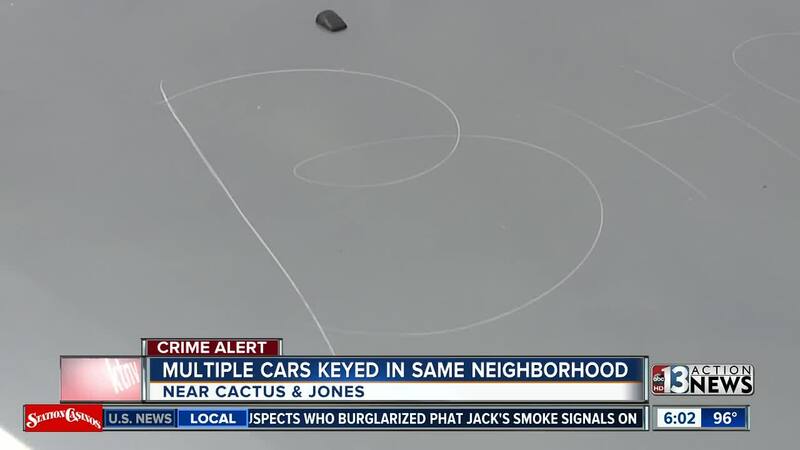 Folks living near Jones Boulevard and Cactus Avenue woke up to the unsettling sight of scratches all over their vehicles. One neighbor took out their cell phone and pressed record, touring the neighborhood and showing all the damaged cars. According to those who live in the area, vandals came through West Haleh Avenue early Sunday morning, damaging 20 or more vehicles. Some had just random scratches and others had cuss words keyed into the vehicle’s body. “It’s a lot of damage to a lot of people,” said one neighbor. Neighbors tell 13 Action News they are afraid the vandals will hit again. Other neighbors, like Alicia, say that seeing something like this happen in her neighborhood is a complete shock. Las Vegas police are investigating.